Looks like we are starting to get a sense of what “disablement” of the Yongbyon reactor might mean. AMBASSADOR HILL: Well, I think this invitation grew out of the visit, the meeting, our bilateral meeting that took place in Geneva. And the concept was that if we’re going to get to full disablement, disabling nuclear facilities, and the declaration of nuclear — full declaration, we wanted to get going with some site surveys. — real nuclear experts to look at some of these facilities with their own eyes, to look at some of the ideas that we’ve had in the denuclearization working group that took place a few weeks ago in Shenyang and to see whether those ideas are really applicable to the actual equipment they will be looking at. So they will be meeting with, of course, North Korean officials and, in fact, working with North Korean officials. Presumably, there will be a discussion about which facilities they’ll have a look at. But this is the first time we’ve had real nuclear experts together with Chinese and Russians, so the three nuclear states in the six-party talks to go and have a look. — Hill asked “what’s ‘disabling.’ Are you cutting certain drive chains? Are you drilling a hole in the side of the reactor?” — offer some sense of the measures on offer. 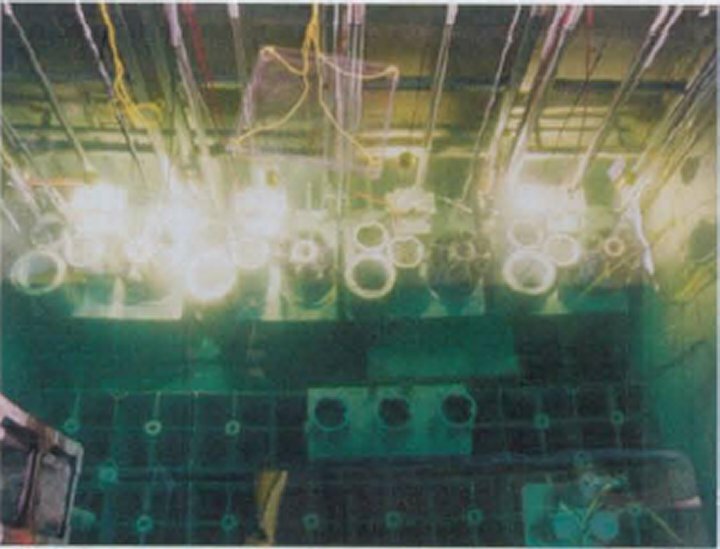 The only other official statement we have is the DOE document that I posted on-line — the official use only paper On the Issue of Initial Disablement Activities at a Reactor (March 2006) — which proposed cutting the drive chains as an interim measure, followed by “additional disablement functions” including disabling the cooling tower, the fuel rod handling machine and “after verification and nuclear forensics are complete” dismantling or permanently entombing the reactor pile. I do not know the extent to which this paper was well or poorly received by the State Department. Certainly the idea of drilling a hole in the side of the reactor — which I presume would eliminate the gas coolant — came from someplace else. Disable/remove/destroy the fuel rod handling machine. Completely dismantle or permanently entomb the reactor pile. Seriously, that is good advice. Great to see progress with the NORKs. Another idea might be to flush the core and the gas cooling system with Boron and/or Iridium in particulate form. This could coat most every surface with a neutron poison. Mechanical intervention should be pursued, especially entombing the facility, but having a big slug of negative reactivity throughout the core and circulating in the gas system might provide insurance should the NORKs want to fix the mechanical interventions. Also, thanks for the link to the interview with Ambassador Hill. In my opinion, “disabling” means more than just preventing operation of the reactor — one should ensure the resulting configuration is SAFE for a long period, as well. For instance, you have to be careful about just cutting certain drive trains, because in the event of an earthquake or other strong shock, the control rods must stay in the core and the reactor must stay subcritical. Sliding pieces of cadmium or boron in between the fuel elements and welding them in place is a good way to ensure shutdown, without affecting the integrity of the core too much. Entombing the reactor in cement is a very permanent solution, as long as decay heat can still be removed. Most reactors that have run at power for more than a few weeks will require a few years to cool sufficiently for dry storage. I was having a similar conversation today. I was recalling that the sarcophagus over Chernobyl — admittedly erected in less than ideal circumstances — requires considerable maintenance. One can imagine that, without carefully thinking through the long-term maintenance issues, we might come to regret some expedient solutions. As mike and thermopile pointed out, poisoning the reactor with hard-to-expel neutron absorbers would “safe” the reactor without compromising safety. Welding control rods in place is also a good idea. Did the agreement for disablement from the six-party talks end with the phrase, “Now Tremble and Obey”? Entombing is a bad idea. Bad. Entombing with the fuel rods inside, as noted above, will require maintenance with no access if something goes wrong. Bad idea. The Soviets had two submarine reactors at the training base in Paldiski, Estonia. When it became clear that they had to leave, they took the reactor cores with them and filled up the containment with concrete. That will continue to have to be maintained for who knows how long. (http://www.iaea.org/OurWork/ST/NE/NEFW/CEG/documents/ws042006_18E.pdf) Bad idea. And who needs a big chunk of concrete just sitting there? Complete disassembly with appropriate disposal of the various components would be the best choice, but does anyone want to bet that it will be chosen? In my opinion removing the fuel rods would almost be required. Ideally the plutonium ought mixed with reactor-grade material to reduce any incentive to recover it for weapons purposes. Removing the fuel-rods would also mitigate the cooling requirements and reduce the risk associated with remaining fission products and actinides. I agree with CKR that entombing the reactor is a bad idea, it would effectively make it impossible to monitor the remaining radioactive material. Perhaps partial removal or destruction of the graphite moderator could be an idea, thou I suppose one would have to be careful about dust formed in the process, and the impact it could have on the core’s stability. I apologize for not being more precise in my earlier post. I support entombment, but was coming at it from the Decommissioning definition of the word, which implies the removal of the fuel elements before the facility is sealed up. Pouring concrete directly over the fuel rods would not be a very good move – which was pointed out in several comments.